GAINESVILLE, Fla. – Programs across the Hough Graduate School of Business at the University of Florida Warrington College of Business once again remained in the top five among public institutions in the 2018 edition of Eduniversal’s Best Master’s Ranking. For the second year, the Master of Science in Management took the No. 1 position among U.S. publics, and UF MBA’s Full-Time program remained in the No. 5 spot. The Nathan S. Collier Master of Science in Real Estate was named the No. 1 program among U.S. publics on the inaugural Real Estate/Wealth Management rankings list from Eduniversal. The Thomas S. Johnson Master of Science in Entrepreneurship jumped to No. 3 among publics, and the Master of International Business came in the No. 3 position. 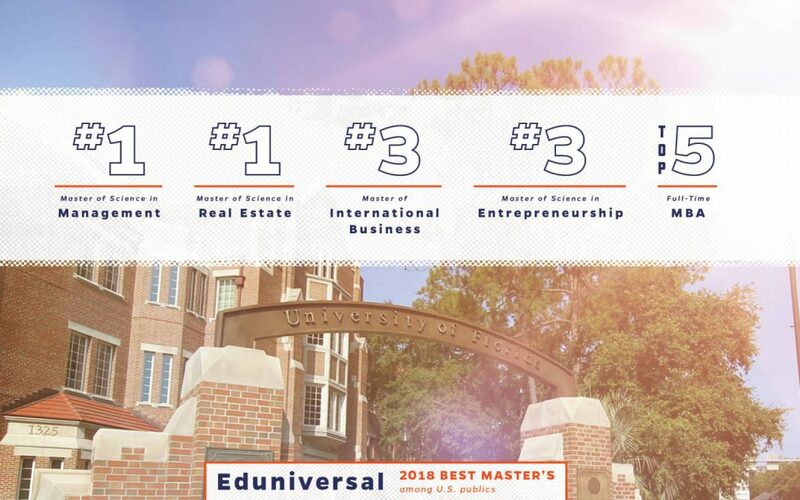 Three other master’s programs were highlighted on Eduniversal’s 2018 Best Master’s Ranking, all in the top 20 among U.S. publics. The William R. Hough Master of Science in Finance came in at No. 10, the Fisher School of Accounting’s Master of Accounting at No. 11 and the Master of Science in Information Systems and Operations Management at No. 16. UF MBA’s marketing track was also highly ranked among U.S. publics, coming in at No. 14. Eduniversal’s Best Master’s Rankings evaluated more than 12,000 postgraduate global master’s programs in 30 fields of study. Eduniversal conducted a global survey of 5,000 international recruiters, 800,000 students, and more than 10,000 representatives from 1,000 academic institutions in 154 countries. The rankings are based on three main criteria: Program reputation, salary upon graduation and student satisfaction.